When it comes to stock market bellwethers, I can think of very few that are as important as J.P. Morgan Chase (NYSE: JPM). If you look at a chart of the S&P 500 going back decades and a chart of the J.P. Morgan, they look exactly the same. This brings me to our current dilemma. As J.P. Morgan goes, so goes the rest of the market, right? If that’s the case, then this stock market has its work cut out for it. 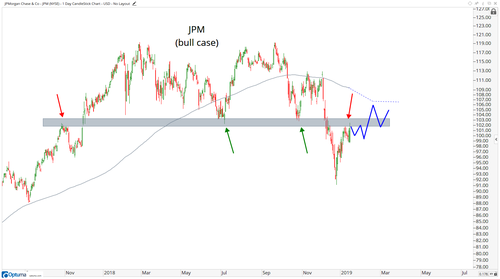 JPM broke some serious support levels last month that have kept it below overhead supply, and that’s a problem for the bulls. 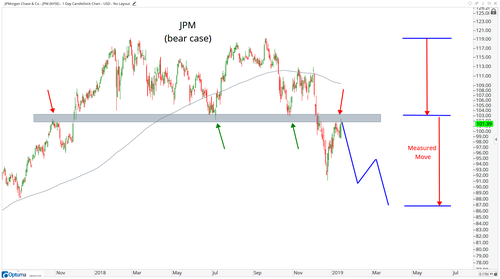 Well, JPM broke below last year’s lows, essentially confirming a double top. This chart screams “re-test of the breakdown,” doesn’t it? Is that what this is? 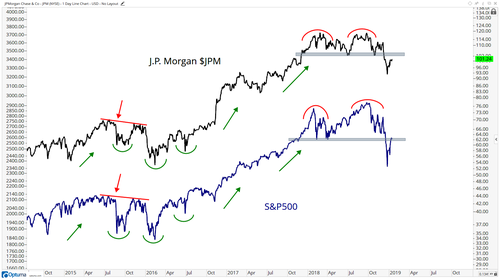 Or is JPM going to work itself off through time instead, and stocks continue higher? All this said, I think this is a 50 & 57 market, as I wrote to you Monday. And we’re watching closely and executing accordingly. But I want to know what you think, too. Let me know at bigmarkettrends@charlesstreetresearch.com.